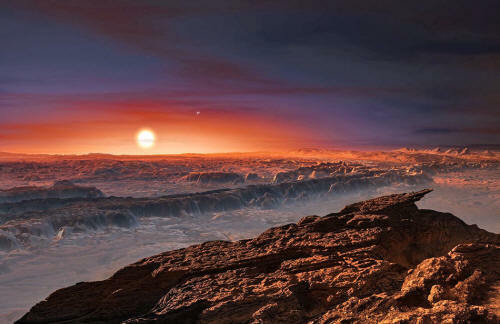 What does "Earthlike" Even Mean and Should it Apply to Proxima Centauri b? to the upper right of Proxima itself. The ESO's recent announcement that they have discovered an exoplanet candidate orbiting Proxima Centauri - thus confirming weeks of speculation - has certainly been exciting news! 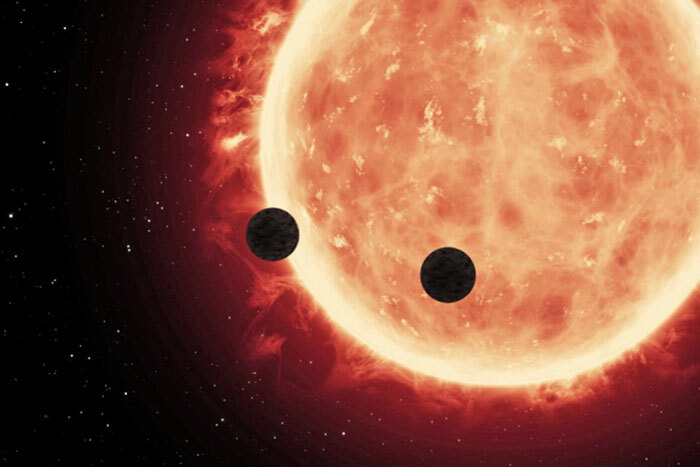 Not only is this latest find the closest extra-solar planet to our own Solar System, but the ESO has also indicated that it is rocky, similar in size and mass to Earth, and orbits within the star's habitable zone. However, in the midst of this news, there has been some controversy regarding certain labels. For instance, when a planet like Proxima b is described as "Earth-like", "habitable", and/or "terrestrial", there are naturally some questions as to what this really means. For each term, there are particular implications, which in turn beg for clarification. For starters, to call a planet "Earth-like" generally means that it is similar in composition to Earth. This is where the term "terrestrial" really comes into play, as it refers to a rocky planet that is composed primarily of silicate rock and metals which are differentiated between a metal core and a silicate mantle and crust. This applies to all planets in the inner Solar System, and is often used in order to differentiate rocky exoplanets from gas giants. This is important within the context of exoplanet hunting, as the majority of the 4,696 exoplanet candidates - of which 3,374 have been confirmed (as of August 18th, 2016) - have been gas giants. What's more, Earth-like generally implies that a planet will be similar in mass and size to Earth. But this is not the same as composition, as many exoplanets that have been discovered have been labeled as "Earth-sized" or "Super-Earths" - i.e. planets with around 10 times the mass of Earth - based solely on their mass. This term also distinguishes an exoplanet candidate from those that are 15 to 17 masses (which are often referred to as "Neptune-sized") and those that have masses similar to, or many times greater than that of Jupiter (i.e. Super-Jupiters). In all these cases, size and mass are the qualifiers, not composition. 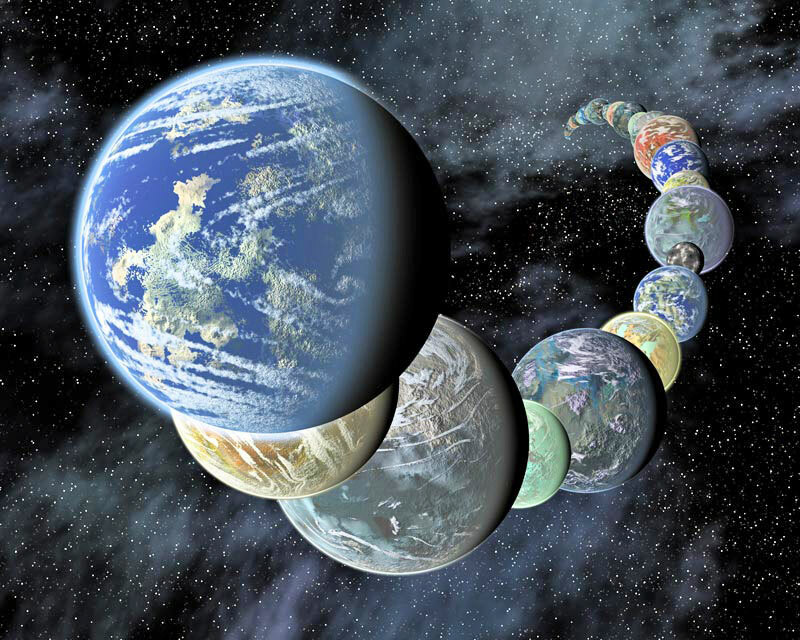 Ergo, finding a planet that is greater in size and mass than Earth, but significantly less than that of a gas giant, does not mean it is terrestrial. In fact, some scientists have recommended that the term "mini-Neptune" be used to describe planets that are more massive than Earth, but not necessarily composed of silicate minerals and metals. And estimates of size and mass are not exactly metrics for determining whether or not a planet is "habitable". This term is especially sticky when it comes to exoplanets. When scientists attach this word to extra-solar planets like Proxima b, Gliese 667 Cc, Kepler-452b, they are generally referring to the fact that the planet exists within its parent star's "habitable zone" (aka. Goldilocks zone). This term describes the region around a star where a planet will experience average surface temperatures that allow for liquid water to exist on its surface. For those planets that orbit too close to their star, they will experience intense heat that transforms surface waster into hydrogen and oxygen - the former escaping into space, the latter combining with carbon to form CO². This is what scientists believe happened to Venus, where thick clouds of CO² and water vapor triggered a runaway greenhouse effect. This turned Venus from a world that once had oceans (Was Venus the First Habitable World of our Solar System?) into the hellish environment we know today, where temperatures are hot enough to melt lead, atmospheric density if off the charts, and sulfuric acid rains from its thick clouds. 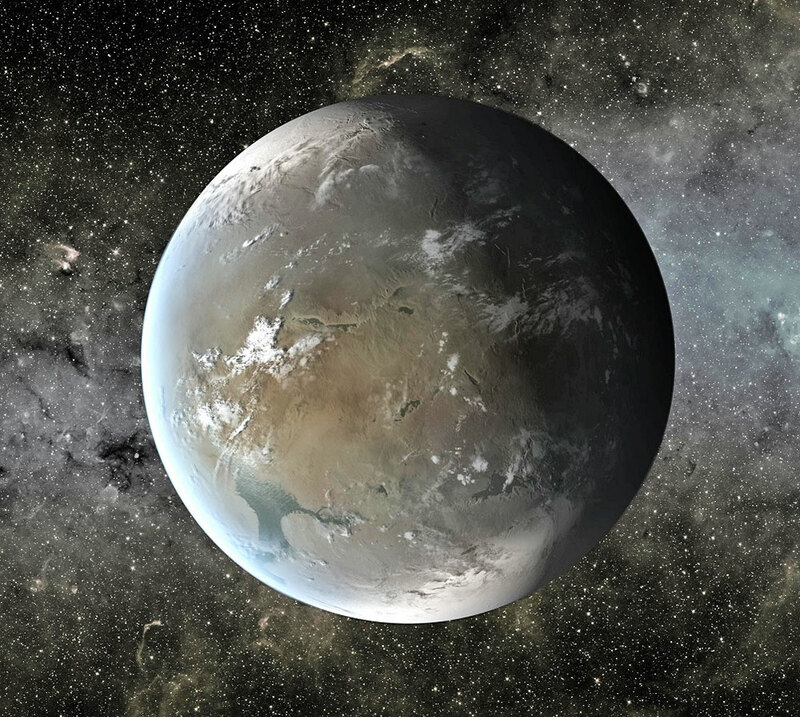 Kepler-62f, an exoplanet that is about 40% larger than Earth. For planets that orbit beyond a star's habitable zone, water ice will become frozen solid, and the only liquid water will likely be found in underground reservoirs (this is the case on Mars). As such, finding planets that are just right in terms of average surface temperature is intrinsic to the "low-hanging fruit" approach of searching for life in our Universe. But of course, just because a planet is warm enough to have water on its surface doesn't mean that life can thrive on it. As our own Solar System beautifully demonstrates, a planet can have the necessary conditions for life, but still become a sterile environment because it lacks a protective magnetosphere. This is what scientists believe happened to Mars. Located within our Sun's Goldilocks zone (albeit on the outer edge of it), Mars is believed to have once had an atmosphere and liquid water on its surface. The reason for this, it has been determined, is because Mars lost its magnetosphere 4.2 Billion years ago. According to NASA's MAVEN mission, this resulted in Mars' atmosphere being slowly stripped away over the course of the next 500 million years by solar wind. What little atmosphere it had left was not enough to retain heat, and its surface water evaporated. Billions of years ago, Mars was a very different world. Liquid water flowed in long rivers that emptied into lakes and shallow seas. A thick atmosphere blanketed the planet and kept it warm. By the same token, planets that do not have protective magnetospheres are also subject to an intense level of radiation on their surfaces. On the Martian surface, the average dose of radiation is about 0.67 millisieverts (mSv) per day, which is about a fifth of what people are exposed to here on Earth in the course of a year. We can expect similar situations on extra-solar planets where a magnetosphere does not exist. Essentially, Earth is fortunate in that it not only orbits in a pretty cushy spot around our Sun, but that its core is differentiated between a solid inner core and a liquid, rotating outer core. This rotation, it is believed, is responsible for creating a dynamo effect that in turn creates Earth's magnetic field. However, using our own Solar System again as a model, we find that magnetic fields are not entirely uncommon. While Earth is the only terrestrial planet in our Solar System to have on (all the gas giants have powerful fields), Jupiter's moon Ganymede also has a magnetosphere of its own. Similarly, there are orbital parameters to consider. For instance, a planet that is similar in size, mass and composition could still have a very different climate than Earth due to its orbit. For one, it may be tidally-locked with its star, which would mean that one side is permanently facing towards it, and is therefore much warmer. On the other hand, it may have a slow rotational velocity, and a rapid orbital velocity, which means it only experiences a few rotations per orbit (as is the case with Mercury). Last, but certainly not least, its distance from its respective star could mean it receives far more radiation than Earth does - regardless of whether or not it has a magnetosphere. This is believed to the be the case with Proxima Centauri b, which orbits its red dwarf star at a distance of 7 million km (4.35 million mi) - only 5% of the Earth's distance from the Sun. It also orbits Proxima Centauri with an orbital period of 11 days, and either has a synchronous rotation, or a 3:2 orbital resonance (i.e. three rotations for every two orbits). Because of this, the climate is likely to be very different than Earth's, with water confined to either its sun-facing side (in the case of a synchronous rotation), or in its tropical zone (in the case of a 3:2 resonance). In addition, the radiation it receives from its red dwarf star would be significantly higher than what we are used to here on Earth. So what exactly does "Earth-like" mean? The short answer is, it can mean a lot of things. And in this respect, its a pretty dubious term. If Earth-like can mean similarities in mass, size, composition, and can allude to the fact that planet orbits within its star's habitable zone - but not necessarily all of the above - then its not a very reliable term. In the end, the only way to keep things clear would be to describe a planet as "Earth-like" if it in fact shows similarities in terms of size, mass and composition, all at the same time. The word "terrestrial" can certainly be substituted in a pinch, but only where the composition of the planet is known with a fair degree of certainty (and not just its size and mass). And words like "habitable" should probably only be used when chaperoned by words like "potentially". After all, being within a star's habitable zone certainly means there's the potential for life. But it doesn't not necessarily entail that life could have emerged there, or that humans could live there someday. And should these words apply to Proxima b? Perhaps, but one should consider the fact that the ESO has announced the detection of a exoplanet using the Radial Velocity method. Until such time as it is confirmed using direct detection methods, its remains a candidate exoplanet (not a confirmed one). But even these simple measures would likely not be enough to erase all the ambiguity or controversy. When it comes right down to it, planet-hunting - like all aspects of space exploration and science - is a divisive issue. And new findings always have a way of drawing criticism and disagreement from several quarters at once. And you thought Pluto's classification confused things! Well, Pluto has got nothing on the exoplanet database! So be prepared for many years of classification debates and controversy..!